Image via Nickelodeon/YouTube Movies News Are You Afraid of the Dark? Paramount Players, Paramount’s new division focused on film adaptations of Paramount’s many IPs, is moving forward with a movie version of the beloved ‘90s Nickelodeon show Are You Afraid of the Dark? Variety reports that Gary Dauberman is set to write the script. Dauberman, of course, is known for being one of the three screenwriters on the recent IT adaptation that made a bajillion dollars. 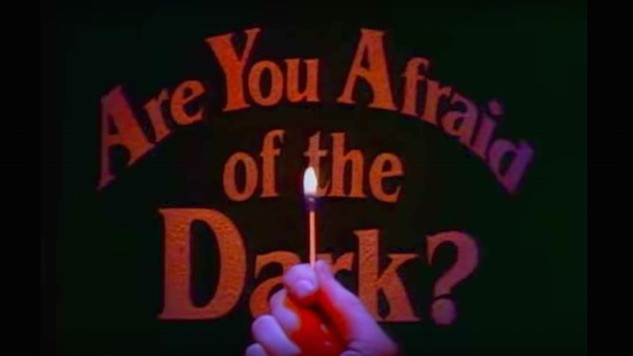 Originally airing from 1992-96, Are You Afraid of the Dark? was a scary story anthology series following a group of kids that called themselves The Midnight Society. They would take turns telling scary stories around a campfire, resulting in an episodic experience not unlike an adolescent Twilight Zone. There was a revival with a new crew and showrunners in 1999. It’s unclear exactly how family-friendly the adaptation will be. Dauberman’s writing is not exactly known for being kid-friendly (his other major credit is Annabelle: Creation). Are You Afraid of the Dark? was aimed at a slightly older audience than, say, Dora the Explorer (another project in the works at Paramount Players), but this is still likely to be a movie primarily for kids. Either way, it will definitely trigger some serious “do you remember the ‘90s?”-type nostalgia. Stay tuned for more info on the film, and find out where Are You Afraid of the Dark? fell on our list of the 50 best horror shows of all time right here.